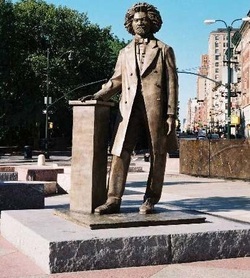 Please find attached an invitation for the dedication of the Frederick Douglass Memorial, located at 110th Street (Cathedral Parkway) and Central Park West (Frederick Douglass Boulevard) at the northwest corner of Central Park. Please circulate the invitation to any friends, scholars, neighbors and associates you think might be interested in attending. Please Click for RSVP contact information. In the mid to late 1990s, a series of community-based design workshops organized by the Central Park Conservancy and later the Cityscape Institute led to a design competition for the circle in 2003—won by a collaborative proposal submitted by Harlem-based artist Algernon Miller and Hungarian-born sculptor Gabriel Koren. Miller is also known locally for his Tree of Hope sculpture dedicated in 1972 on Adam Clayton Powell Boulevard. Koren has sculpted the Malcolm X Memorial statue located at the site of the former Audubon Ballroom, where the civil rights leader was slain. For the Frederick Douglass Memorial Miller’s overall design includes granite seating and paving patterns based on traditional African-American quilt motifs, as well as a bronze perimeter fence with a wagon wheel motif. He also responded to the design competition guidelines with a bronze water wall depicting the Big Dipper constellation that guided those on the “underground railroad.” Koren crafted a standing bronze portrait of a pensive Douglass, cast at Polich-Tallix bronze foundry, and inspired by nineteenth-century photographs. The circle and memorial opened to the public in June of 2010, and after further improvements were formally dedicated on September 20, 2011.